When it rains it pours! I have been suffering from a monster migraine for about 7 days. I even had to break down and go to the doctor. But the visit was fabulous...they gave me two happy shots right in my booty and it began to calm the pain down. 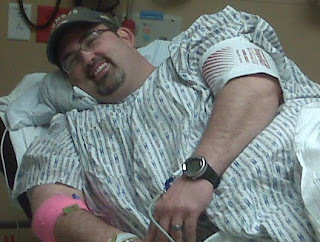 In the midst of my comatose state on the couch I got a phone call from Steve, who also had to see the doc, and he said "I have to go to the emergency room right now!". I couldn't comprehend what he was telling me. All I could come up with was "I can't drive you!". Steve's mom came up from Spanish Fork to take us to the ER. Why did Steve have to go to the ER? A few days ago he noticed an irritation on his leg. When it didn't go away he decided to go to the doc. Turns out he has a staph infection that he possibly contracted from the bike at the gym. The poor guy had to have the infection drained and packed. For the next few days he has to go back to the hospital to get an IV of antibiotics. The bad news is the doc said it didn't look better today and if it doesn't look better tomorrow they will have to take more drastic measures.......we can only hope for the best and that the 3 antibiotics he is on will work. Hope you both get better soon! Let us know it you need anything. I hope you are both better soon! Oh Linds!!! I hope everything will be ok. I am just glad he caught it in time. Those are nothing to mess around with! Keep us posted! And what is the news on the kids?